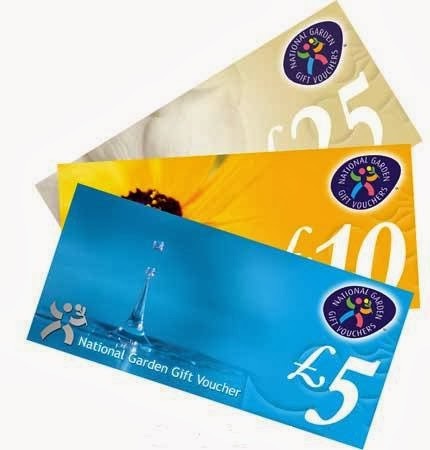 This month we have been offered a £50 National Garden Voucher for one lucky reader to win. With access to over 2,000 leading garden centres, make sure your kitted out this Autumn! Choose from over 90,000 garden and leisure products – this is the perfect give away for any garden lover. You don’t need to be an experts to appreciate this offer – Enter now for your chance to win! To enter simply tell us what you would spend your voucher on. Terms and conditions: This competition closes at 23.59 on 30 November 2013. Any entries received after this time will not be counted. Entrants must be UK residents aged 18 years or older to enter. By entering this competition you agree and consent to your name being published and by taking part in the competition, entrants are deemed to have read, understood and accepted all of the Terms and Conditions and agreed to be bound by them. The winner will be selected at random from the valid entries and will be announced here on the blog. Please make sure we are able to contact you if you do win.Entries can be made as "anonymous" on the blog but if you don't leave a Twitter name or other way to contact you then those will not be counted. Something colourful for my mum's garden. I'd spend it on my new allotment. We're clearing it over the winter but it'd be great to get it looking nice in spring! I'd get some vegetable seeds! A bay tree for my front garden. A small tree, to replace one I lost last winter. Nematodes to try and control the slugs which even killed my herbs this year. Bits and pieces for a veggie garden I think. Lots of veg seeds and some compost to grow them in. I'd love to buy a new mini greenhouse (mine got destroyed just a few weeks ago in bad weather) and some vegetable & herb seeds. Would have to be seeds and new hand tools for our allotment which would help getting it ready for spring and the new season ahead. I would buy some plants that are colourful in memory of my best friend who has just sadly left this world. He was always lively and full of colour, so I would choose appropriately. I'd put it towards a new cold frame. I'd buy two ornamental Yew Trees so my house name makes sense! I had quite a few fat bumble bees this summer, so would buy more lavender plants, and other bee-friendly plants. I would put it towards some raised beds. I would love to use it to buy some pots for my garden. Some new bedding plants for next year. I'd buy compost for next year's flower pots and some manure for the veg plot. I would love a cold frame. Hedge Trimmer and assorted garden tools! I'd give the vouchers to my mum as she loves gardening! I think she would but lots of vegetable seeds for next summer! I want to build a fairy garden for my kids (they're 5 and 4) and are so excited at the prospect of seeing a real fairy. Definately a new rake. The leaves in my garden are a nightmare ! I need a little stone divider between my flower bed in the front of the house, and the rest of the grass - otherwise there's never a neat edge for long, and the weeds always creep in. I'd spend it on seeds and new planters for the Spring. A new apple tree as my old one was blown down in the recent storm. I would use the vouchers towards buying a new hose as ours has gone brittle and has some leaks. I would buy a pond to encourage more wildlife into our garden. Definatly spring bulbs after all its winter need some life back in the garden already! I would spend it on some garden tools. My garden is in need of a huge overhaul so some tools to do the job would be perfect. I would share it with my Mum for her allotment. I'd love to get a massive selection of alpines to fill a new rockery I'm building. I love variety of textures and colours and different flowering times! Liked and shared on facebook and following on G+! Thanks for the competition! I would love a Japanese maple for the front garden, the autumn colour of a neighbours tree has been amazing this autumn. Some new pots - my old ones have seen better days! I would actually give it to my brother for Christmas! He has two allotments and loves gardening. Some spring bulbs to brighten up my garden. I would spend it on Grass Seed for my back garden after this summer of a paddling pool being down and children in and out the lawn has seen better days and needs a little help getting back to normal! I would like to spend the voucher on pots for my garden so I can fill it with more colour and make it a more pleasant space. Plants for my new garden. astrantia and a rowan tree as the one we had overhanging our garden next door has been chopped down and our goldfinches are no longer around now. Vegeatble seeds for next year and some onion sets and seed potatoes. My parents have got half-way through creating a water feature but have run out of money. They're so supportive of me that I'd love to give them a bit of help for a change. I would put it towards buying a really good windbreak for my hilltop vegetable plot. I'd put it towards a large wooden planting trough. There's a space just waiting for it. I'd use it to buy a nice pit plant for the house. Some of the plants are poorly in the conservatory after this cold weather, so need a couple to make it look green again! some nice wildlife attracting plants for my front garden - now I've pulled the weeds out of it there arent any other plants left. Expand my small vegetable patch. Something to make my garden look fantastic for when we sell the house next year. I don't know what the money would go on exactly but I do know it would be a lovely trip out taking my Nan to spend it on her garden. An automatic vent for the greenhouse window. Vegetable plants or a cherry tree. I would spend it on wildflower seeds, and then maybe some plants later, to encourage bees in to the garden. A rake and some weedkilller... The garden's a mess right now. I would buy some big hardy shrubs as nothing seems to grow in my garden! I'd spend it on some yummy vegetable plants for my veggie garden! Red cabbage and broccoli would be nice! I would buy some small fruit trees. Even in a small garden there is room for the dwarf root stock versions and they give as much blossom and colour as an ornamental tree. I'd buy a hedge trimmer. I would love to get a yellow buddleia to attract butterflies.